Forget boiling eggs and cooking rice separately when making egg biryani. 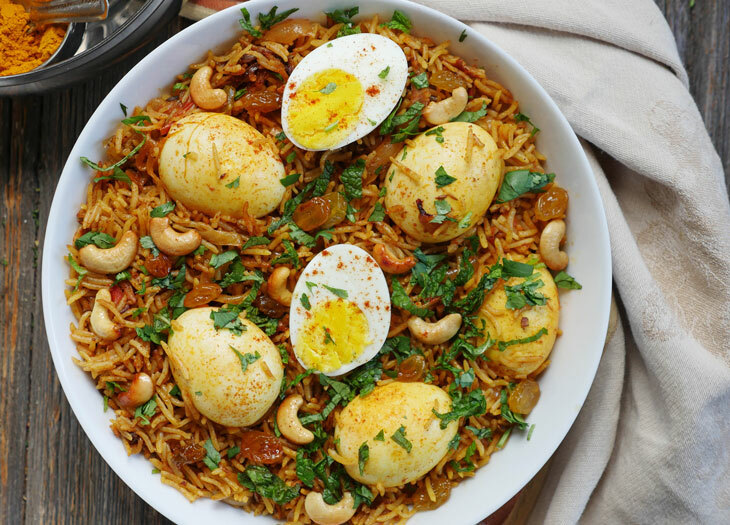 With my one-pot egg biryani recipe, you can cook hardboiled eggs AND biryani rice in your instant pot all at the exact same time! 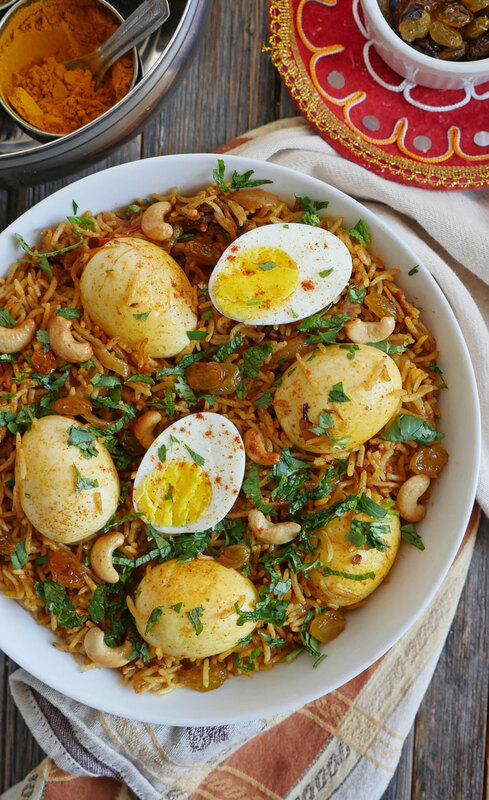 This one-pot egg biryani is so easy to make! You can cook the eggs and the rice together in your instant pot and the two turn out perfectly cooked: bright yellow yolks and separate grains of rice. Not only is this dish easy to make and budget-friendly, it’s absolutely delicious! I am all about making one-pot biryanis because they are just so easy to make AND they taste just as good as biryani made the time-consuming way (cooking everything half-way then layering it together, then cooking it again). If you have an electric pressure cooker like the instant pot, then biryani suddenly becomes so much more accessible. It doesn’t have to be a “special occasion dish” because it’s easy enough to make on a weeknight. 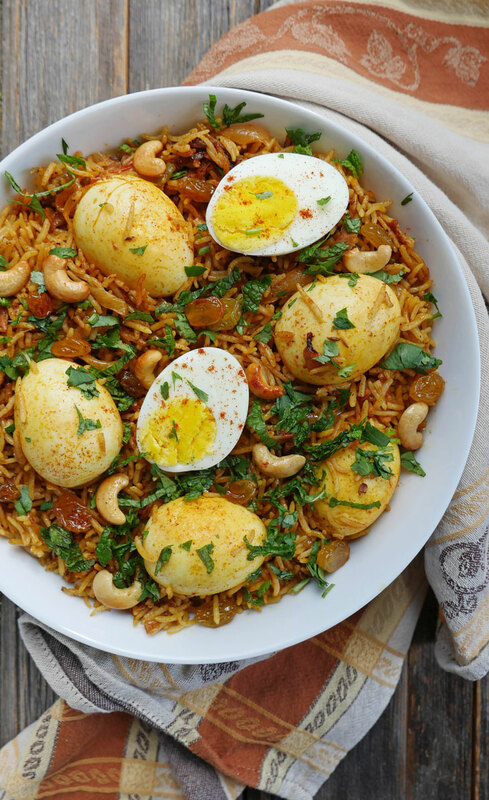 I have to tell you that I like this egg biryani just as much as my other meat-based biryani recipes. It is SO flavorful and delicious. You know how Pizza Fridays are a thing? Well I’m switching things up at our house and we’re now doing Biryani Fridays. We are observing Lent right now, so now I’ve got three biryani options for Fridays: shrimp biryani, vegetable biryani and this egg biryani. I think I need to share a fish biryani recipe too! 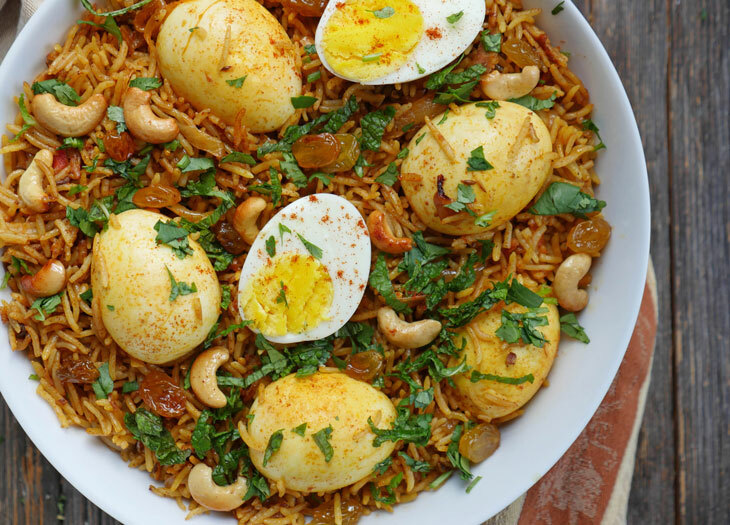 I can’t wait to hear what y’all think of this egg biryani recipe. I’m so proud of it! I hope you love it a lot! 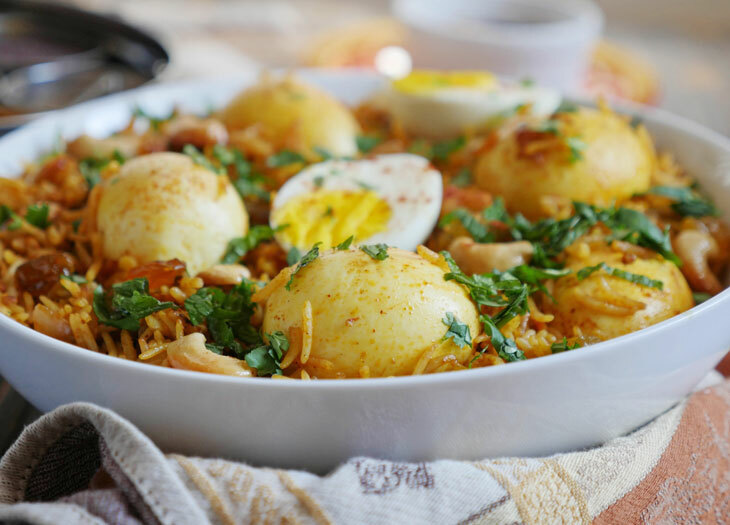 This flavorful egg biryani is absolutely delicious and easy to make: you can cook the eggs and rice together all in one pot! Soak the basmati rice in cold water for 15 minutes. Drain, rinse and set aside. Press the sauté button and add the oil to the pot. Allow it a minute to heat up, then add the whole spices and stir. Once the cumin seeds brown, add the onions. Stir-fry for 5-7 minutes, or until the onions begin to brown. Add the garlic, ginger, ground spices and stir, then add the tomato and cook for 2-3 minutes, or until it softens a bit. Add rice and water to the pot, then place a steamer basket into the pot (on top of the rice). Place the eggs in the steamer basket. Secure the lid, close the pressure valve and cook for 10 minutes at high pressure. Remove the steamer basket and the eggs from the pot. Place the eggs into a bowl of ice cold water for 5 minutes. Peel the eggs. Optional step: at this point, you can fry the eggs in a pan on the stovetop to give the eggs a bit more flavor and color. To do this, heat 1 tablespoon of oil in a pan, add the eggs and sprinkle a pinch of paprika, cayenne, turmeric and salt on the eggs. Place the peeled eggs back into the cooked rice and mix well. Garnish with cilantro, mint and ghee-coated cashews and raisins if using. To make the optional ghee-coated cashews and raisins, melt 2 tablespoons of ghee in a pan over low-medium heat on the stovetop. Add ⅓ cup of halved cashews and 2 tablespoons of golden raisins to the pan and stir-fry until the cashews begin to turn golden. You can also scramble an egg and add it to the rice for more protein/egg flavor if you’d like! I would do this in a separate pan and then add it to the rice at the end. Most Indians grow up knowing to eat around the whole spices once a dish is served, however if you or your guests are not used to this, you can remove them prior to serving. I absolutely love this brand of basmati rice – it is very different (in my opinion) than other brands of basmati rice. I have a question. How does the egg gets boiled? By using steam will the eggs boil perfectly ? Thank you!! And yes, the eggs are cooked in the steam 🙂 Just put a trivet (stand) on top of the rice and place the eggs right on top. They will turn out perfectly! Let me know how it goes! Could you use a 1/2 cup or so of the onion masala in this instead of adding them separately? Also, we’re observing Lent as well. Hello Ashley! Can I triple the recipe in the instant pot, I probably cook the eggs separately. Hi Mina, I am sure you can triple the recipe (you can keep the cook time the same) and yes, I’d also suggest cooking the eggs separately if you’re making that quantity. Let me know how it goes! I would love it if you could add the number of servings along with the recipe information. I’m a pretty new cook, so I’m not sure about quantities. Knowing the approximate servings will make it easier for me to scale the recipe as needed. Why tomatoes in this recipe when the other biryani’s don’t have it? Can the tomatoes be added to the vegetable or chicken biryani as well? Also can yogurt be added to this and the other biryani recipes? The stovetop method usually calls for marinating meat/veggies in yogurt before cooking, so wondering if adding yogurt will enhance the flavor. Hi Ashish, I just like to switch things up sometimes 🙂 You can add tomatoes to the other recipes if you’d like. I did leave them out of the veggie biryani intentionally because I didn’t want to add additional water-producing veggies to the rice, but you can try adding it in – I’m sure it’ll still be good. Also, I have a biryani with a yogurt marinade coming to the blog soon – just need to make a few tweaks so stay tuned! Irene, if you want to also add scrambled eggs then I would scramble them separately and add them in at the end 🙂 You don’t have to do this but it’s a nice way to add extra protein if desired – totally up to you! And that’s great to hear – hope to share a fish biryani in the coming weeks! What is a substitute for cayenne.I don’t have it . Unfortunately I got the burn code as soon as it had got to pressure so I had to take everything out cleaned the pot and put everything back in plus another cup of water. The same thing happened again but this time when I tasted both the rice and eggs were cooked. Actually quite tasty but seems to have worked without pressure cooking? How do you prevent burning? Do you have a non stick pot? Anita, the burn sign can come on if there are spices burnt at the bottom – I have heard that if the pot comes to pressure then there’s no need to worry about the sign. Hopefully the issue doesn’t come up again – I suggest adding the spices all at once to prevent burning – hopefully that’ll help? What a tasty recipe! I love how we can cook both the rice and eggs in the instant pot SIMULTANEOUSLY! The flavors are on point! Hi, If I was going to use brown basmati rice instead, do i need to increase the cook time? I’m relatively new at using the Instant Pot and have made simple recipes like dal & regular rice. Really looking forward to making this Biryani! Your blog is fantastic! So great for instant pot beginners like me! Hi Sam! I think I already replied to you on IG but I’ll share my reply here just incase others have the same question – I suggest using quick cooking brown basmati rice as that cooks in the same amount of time as white basmati. For this recipe, I think using brown basmati (which calls for a 22 min cook time) will overcook the eggs but if you don’t mind slightly overcooked eggs then it should be okay! please let us know how it goes! Can’t believe how good this turned out. Thanks!